I have this thing I do when deciding about a book. Do you do this too? Whether standing in the bookstore or the library stacks, at a rotating book rack in the airport or, even, in front of a bookshelf in the home of a friend: I open the book at random and I read. Generally, I do this in more than one place–within the book, I mean. Reading here, reading there. I avoid the beginning. I never (almost never) read the beginning. It’s so difficult to tell with a beginning. I’m of the opinion that almost anyone can write a good, compelling beginning–because you can be fascinating there, crazy weird. You can invent fabulous metaphors that oblige the reader to continue. And I do love that. But, perhaps like the much-maligned cover (do you judge a book by it? and I will add here that many, many book covers are Simply Bad, and a good design is a wonder and incredibly helpful), a good beginning is, as I said, do-able. The trick in writing a good book, it seems to me, is sustaining it. So I don’t look to see whether the author starts well. And of course I don’t read the ending (that’s just mean). But I look here and there in the in-between places, and I check out the writing. All of this to say that I had a very interesting experience on Friday. It was, so far, anyway, a once-in-a-lifetime experience. And as first-times go, it will only happen to me This Once. I received in my own two hands a copy of my book. I wasn’t prepared for this, which is silly. You would think I would be, what with knowing for some time now (since July) that my novel would be published. My editor had contacted me to say the books were ready. I knew, when driving to the “office,” (which is the private home of some in this publishing company) what I was there for: to get a copy of the book. One would think I would know what was coming. But I arrived later than I’d planned and also felt in a hurry to get home. And these gracious people (my publishers are Incredibly Gracious People) were holding a dinner party. I stood on the edge of their living room and was graciously introduced and I was apologetic and also full of admiration for their (I could see them at a distance) stuffed grape leaves. And then I was handed the book. I had seen the cover before in photographs on my screen. I had also seen a photograph of the back. And as I said I do with any book–this time also chatting with the gracious couples seated a short distance away–I cracked the book open at random and began to read. It took a second or two. A beat maybe. And this, perhaps, because these words are so familiar to me. I know them like I know (no fancy metaphor here) the back of my hand. I know them, in truth, like the back of my mind, because these words have coursed through it myriad times: in contemplative silence before a blank computer screen; in the cautious scratching of a trial run; in uncounted edits, tested for word choice, measured for rhythm. Yet he could calmly descend the crooked concrete steps of the Senchak’s split-level ranch, swinging his keys on their ring, clear-eyed and quiet. The shadows had dark centers and paler edges, but a shift in the breeze made the shadows seem to exchange those dark hearts again and again, passing them back and forth to one another in untraceable, effortless action. I stood there on the edge of my publisher’s living room, open book in hand, and suddenly I realized that these words I perused were none other than My Own, appearing for the first time not illumined by the artificial light of a computer screen, not printed awkwardly on 8×10 paper, but bound and set as book. Ivory paper, page numbers, the book title and my name secured and centered at the tops of the page. I think I squealed just a little bit–which was accidental and embarrassing, but far better than crying, which might also have been defensible. Moments later I was out the door, two copies of the book in hand and, in the other, four stuffed grape leaves wrapped in foil. Incredibly Gracious People. 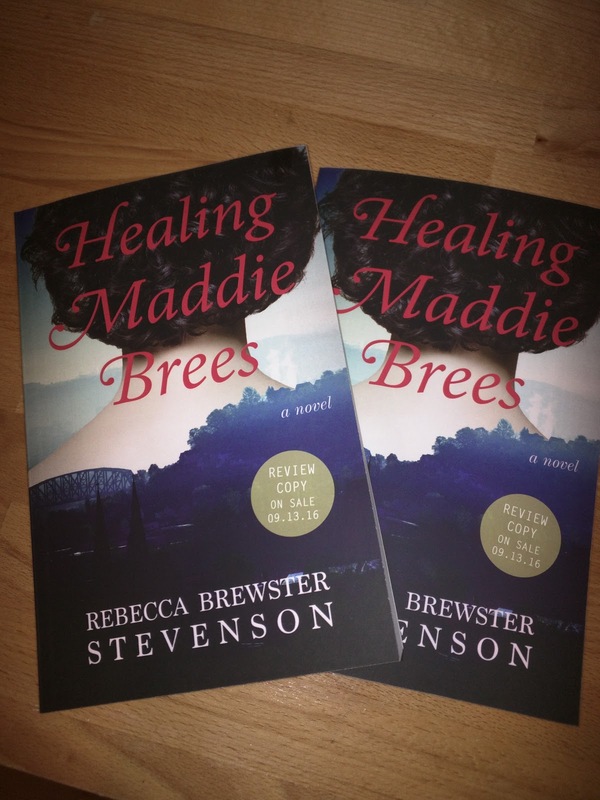 Then yesterday, my editor sent me this news, along with the picture: Healing Maddie Brees is out the door and, shortly, will be in more hands than mine. She’s headed to places like Kirkus Reviews and Publishers Weekly, to the Library Journal and, even, to The New York Times Review of Books. Just, you know, to see what they think. They’ll see the cover first. Which is beautiful. And then they’ll look inside. 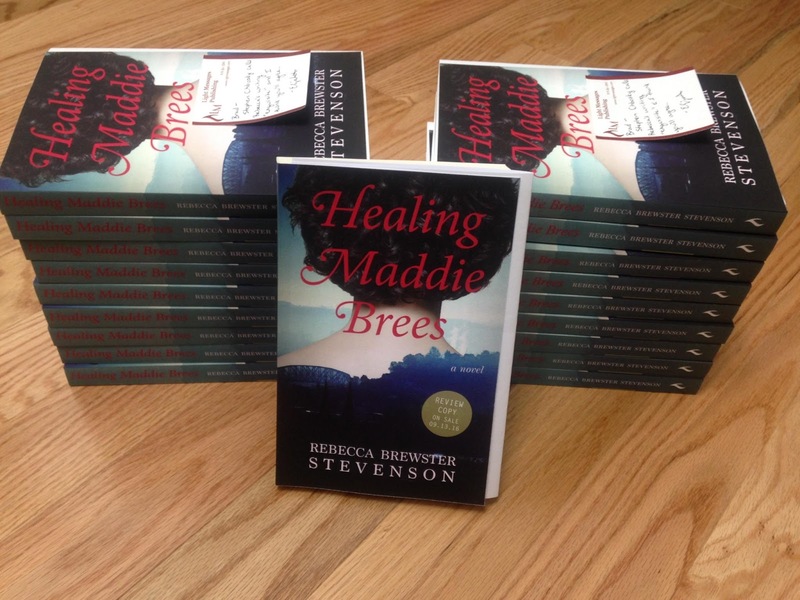 I imagine they’ll read the first pages, but maybe they’ll do what I do and cut somewhere into the middle. Then, with any luck, with all hope, perhaps they will read the Whole Thing. Maybe they will love her.